I truly believe I have discovered the oasis of Dublin. 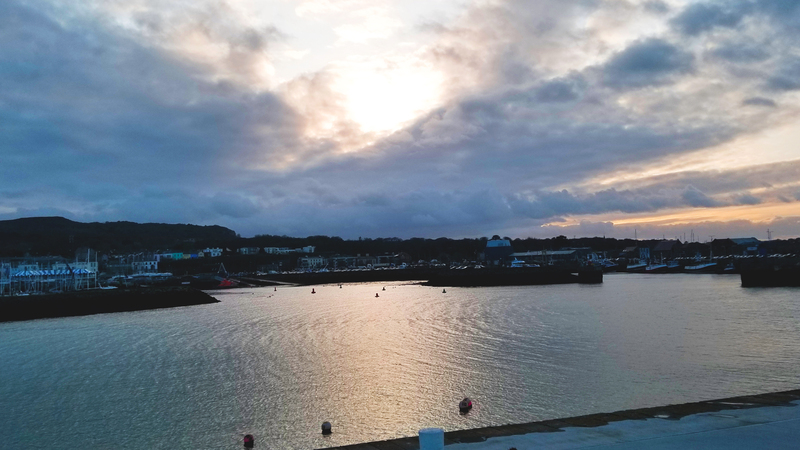 Looking for local adventure (and because we sorely needed to learn how to use Dublin public transport), my roommates and I hopped on a bus to Howth for some seaside exploring. Howth is known for it's weekend market, seafood, and lovely coastal trails. The crisp air filled our lungs and we set at a brisk pace down a trail to get some blood moving through our frozen toes. You could see across the whole city all the way to where the sea drained into the sky. We made it to the markets where locals and visitors bustled around, engaged by the sounds of street performers and smells of food stands. The Howth Market featured a variety of cultural cuisines and local artisans selling beautiful crafts. We took a short break and my friend, Lexi, shared her mountain of garlic mayo fries with us. Afterward, we went to the boardwalk and walked out to the ocean on the narrow stone trip. There was something utterly captivating about the vast expanse of ocean and how the sunbeams highlighted the gentle ripple of waves. Like the billowing sails of a ship amidst salty gales, my heart swelled, and I felt this glow of gratitude and immense peace deep within. Beauty of this scale was gold for the soul, a memory fit for a treasure trove, and I felt a bizarre responsbility to fully revel in this view on behalf of the rest of the world, which in this moment could not have been more fortunate than I.